This article is about the monster. For the film franchise, see Godzilla (franchise). For other uses, see Godzilla (disambiguation). "ゴジラ" redirects here. For other uses of "Gojira", see Gojira (disambiguation). Godzilla (Japanese: ゴジラ, Hepburn: Gojira) (/ɡɒdˈzɪlə/; [ɡoꜜdʑiɾa] ( listen)) is a monster originating from a series of Japanese films of the same name. The character first appeared in Ishirō Honda's 1954 film Godzilla and became a worldwide pop culture icon, appearing in various media, including 32 films produced by Toho, three Hollywood films and numerous video games, novels, comic books and television shows. It is dubbed the King of the Monsters, a phrase first used in Godzilla, King of the Monsters!, the Americanized version of the original film. Godzilla is depicted as an enormous, destructive, prehistoric sea monster awakened and empowered by nuclear radiation. With the nuclear bombings of Hiroshima and Nagasaki and the Lucky Dragon 5 incident still fresh in the Japanese consciousness, Godzilla was conceived as a metaphor for nuclear weapons. As the film series expanded, some stories took on less serious undertones, portraying Godzilla as an antihero, or a lesser threat who defends humanity. With the end of the Cold War, several post-1984 Godzilla films shifted the character's portrayal to themes including Japan's forgetfulness over its imperial past, natural disasters and the human condition. Godzilla has been featured alongside many supporting characters. It has faced human opponents such as the JSDF, or other monsters, including King Ghidorah, Gigan and Mechagodzilla. Godzilla sometimes has allies, such as Rodan, Mothra and Anguirus, and offspring, such as Minilla and Godzilla Junior. Godzilla has also fought characters from other franchises in crossover media, such as the RKO Pictures/Universal Studios movie monster King Kong and the Marvel Comics characters S.H.I.E.L.D., the Fantastic Four and the Avengers. Gojira (ゴジラ) is a portmanteau of the Japanese words: gorira (ゴリラ, "gorilla") and kujira (鯨 (クジラ), "whale"), which is fitting because in one planning stage, Godzilla was described as "a cross between a gorilla and a whale", alluding to its size, power and aquatic origin. One popular story is that "Gojira" was actually the nickname of a corpulent stagehand at Toho Studio. Kimi Honda, the widow of the director, dismissed this in a 1998 BBC documentary devoted to Godzilla, "The backstage boys at Toho loved to joke around with tall stories". listen); the Anglicized form is /ɡɒdˈzɪlə/, with the first syllable pronounced like the word "god" and the rest rhyming with "gorilla". In the Hepburn romanization system, Godzilla's name is rendered as "Gojira", whereas in the Kunrei romanization system it is rendered as "Gozira". During the development of the American version of Godzilla Raids Again (1955), Godzilla's name was changed to "Gigantis", a move initiated by producer Paul Schreibman, who wanted to create a character distinct from Godzilla. Within the context of the Japanese films, Godzilla's exact origins vary, but it is generally depicted as an enormous, violent, prehistoric sea monster awakened and empowered by nuclear radiation. Although the specific details of Godzilla's appearance have varied slightly over the years, the overall impression has remained consistent. Inspired by the fictional Rhedosaurus created by animator Ray Harryhausen for the film The Beast from 20,000 Fathoms, Godzilla's iconic character design was conceived as that of an amphibious reptilian monster based around the loose concept of a dinosaur with an erect standing posture, scaly skin, an anthropomorphic torso with muscular arms, lobed bony plates along its back and tail, and a furrowed brow. Art director Akira Watanabe combined attributes of a Tyrannosaurus, an Iguanodon, a Stegosaurus and an alligator to form a sort of blended chimera, inspired by illustrations from an issue of Life magazine. To emphasise the monster's relationship with the atomic bomb, its skin texture was inspired by the keloid scars seen on survivors in Hiroshima. The basic design has a reptilian visage, a robust build, an upright posture, a long tail and three rows of serrated plates along the back. In the original film, the plates were added for purely aesthetic purposes, in order to further differentiate Godzilla from any other living or extinct creature. 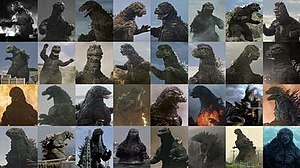 Godzilla is sometimes depicted as green in comics, cartoons and movie posters, but the costumes used in the movies were usually painted charcoal grey with bone-white dorsal plates up until the film Godzilla 2000. Godzilla's signature weapon is its "atomic heat beam", nuclear energy that it generates inside of its body and unleashes from its jaws in the form of a blue or red radioactive beam. Toho's special effects department has used various techniques to render the beam, from physical gas-powered flames to hand-drawn or computer-generated fire. Godzilla is shown to possess immense physical strength and muscularity. Haruo Nakajima, the actor who played Godzilla in the original films, was a black belt in judo and used his expertise to choreograph the battle sequences. Godzilla can breathe underwater and is described in the original film by the character Dr. Yamane as a transitional form between a marine and a terrestrial reptile. Godzilla is shown to have great vitality: it is immune to conventional weaponry thanks to its rugged hide and ability to regenerate and as a result of surviving a nuclear explosion, it cannot be destroyed by anything less powerful. Various films, television shows, comics and games have depicted Godzilla with additional powers, such as an atomic pulse, magnetism, precognition, fireballs, an electric bite, superhuman speed, eye beams and even flight. Godzilla's allegiance and motivations have changed from film to film to suit the needs of the story. Although Godzilla does not like humans, it will fight alongside humanity against common threats. However, it makes no special effort to protect human life or property and will turn against its human allies on a whim. It is not motivated to attack by predatory instinct: it does not eat people and instead sustains itself on nuclear radiation and an omnivorous diet. When inquired if Godzilla was "good or bad", producer Shogo Tomiyama likened it to a Shinto "God of Destruction" which lacks moral agency and cannot be held to human standards of good and evil. "He totally destroys everything and then there is a rebirth. Something new and fresh can begin." Godzilla battles King Kong in King Kong vs. Godzilla (1962). This film has the highest Japanese box office attendance figures in the entire Godzilla series to date. In the original Japanese films, Godzilla and all the other monsters are referred to with gender-neutral pronouns equivalent to "it", while in the English dubbed versions, Godzilla is explicitly described as a male, such as in the title of Godzilla, King of the Monsters!. The creature in the 1998 Godzilla film was depicted laying eggs through parthenogenesis. Godzilla has a distinctive disyllabic roar (transcribed in several comics as Skreeeonk! ), which was created by composer Akira Ifukube, who produced the sound by rubbing a pine-tar-resin-coated glove along the string of a contrabass and then slowing down the playback. In the American version of Godzilla Raids Again (1955) entitled Gigantis the Fire Monster, Godzilla's iconic roar was substituted with that of the monster Anguirus. From The Return of Godzilla (1984) to Godzilla vs. King Ghidorah (1991), Godzilla was given a deeper and more threatening-sounding roar than in previous films, though this change was reverted from Godzilla vs. Mothra (1992) onwards. For the 2014 American film, sound editors Ethan Van der Ryn and Erik Aadahl refused to disclose the source of the sounds used for their Godzilla's roar. Aadahl described the two syllables of the roar as representing two different emotional reactions, with the first expressing fury and the second conveying the character's soul. Godzilla's size is inconsistent, changing from film to film, and even from scene to scene, for the sake of artistic license. The miniature sets and costumes were typically built at a ​1⁄25–​1⁄50 scale and filmed at 240 frames per second to create the illusion of great size. In the original 1954 film, Godzilla was scaled to be 50 m (164 ft) tall. This was done so Godzilla could just peer over the largest buildings in Tokyo at the time. In the 1956 American version, Godzilla is estimated to be 122 m (400 ft) tall, because producer Joseph E. Levine felt that 50 m did not sound "powerful enough". As the series progressed Toho would rescale the character, eventually making Godzilla as tall as 100 m (328 ft). This was done so that it would not be dwarfed by the newer, bigger buildings in Tokyo's skyline, such as the 243-meter-tall (797 ft) Tokyo Metropolitan Government Building which Godzilla destroyed in the film Godzilla vs. King Ghidorah (1991). Supplementary information, such as character profiles, would also depict Godzilla as weighing between 20,000 and 60,000 metric tons (22,000 and 66,000 short tons). In the American film Godzilla (2014) from Legendary Pictures, Godzilla was scaled to be 108.2 m (355 ft) and weighing 90,000 metric tons (99,000 short tons), making it the largest film version at that time. Director Gareth Edwards wanted Godzilla "to be so big as to be seen from anywhere in the city, but not too big that he couldn't be obscured". For Shin Godzilla (2016), Godzilla was made even taller than the Legendary version, at 118.5 m (389 ft). Godzilla's appearance has traditionally been portrayed in the films by an actor wearing a latex costume, though the character has also been rendered in animatronic, stop-motion and computer-generated form. Taking inspiration from King Kong, special effects artist Eiji Tsuburaya had initially wanted Godzilla to be portrayed via stop-motion, but prohibitive deadlines and a lack of experienced animators in Japan at the time made suitmation more practical. The first suit consisted of a body cavity made of thin wires and bamboo wrapped in chicken wire for support and covered in fabric and cushions, which were then coated in latex. The first suit was held together by small hooks on the back, though subsequent Godzilla suits incorporated a zipper. Its weight was in excess of 100 kg (220 lb). Prior to 1984, most Godzilla suits were made from scratch, thus resulting in slight design changes in each film appearance. The most notable changes during the 1960s-70s were the reduction in Godzilla's number of toes and the removal of the character's external ears and prominent fangs, features which would later be reincorporated in the Godzilla designs from The Return of Godzilla (1984) onward. The most consistent Godzilla design was maintained from Godzilla vs. Biollante (1989) to Godzilla vs. Destoroyah (1995), when the suit was given a cat-like face and double rows of teeth. Several suit actors had difficulties in performing as Godzilla, due to the suits' weight, lack of ventilation and diminished visibility. Kenpachiro Satsuma in particular, who portrayed Godzilla from 1984 to 1995, described how the Godzilla suits he wore were even heavier and hotter than their predecessors because of the incorporation of animatronics. Satsuma himself suffered numerous medical issues during his tenure, including oxygen deprivation, near-drowning, concussions, electric shocks and lacerations to the legs from the suits' steel wire reinforcements wearing through the rubber padding. The ventilation problem was partially solved in the suit used in 1994's Godzilla vs. SpaceGodzilla, which was the first to include an air duct, which allowed suit actors to last longer during performances. In The Return of Godzilla (1984), some scenes made use of a 16-foot high robotic Godzilla (dubbed the "Cybot Godzilla") for use in close-up shots of the creature's head. The Cybot Godzilla consisted of a hydraulically-powered mechanical endoskeleton covered in urethane skin containing 3,000 computer operated parts which permitted it to tilt its head and move its lips and arms. In Godzilla (1998), special effects artist Patrick Tatopoulos was instructed to redesign Godzilla as an incredibly fast runner. At one point, it was planned to use motion capture from a human to create the movements of the computer-generated Godzilla, but it was said to have ended up looking too much like a man in a suit. Tatopoulos subsequently reimagined the creature as a lean, digitigrade bipedal iguana-like creature that stood with its back and tail parallel to the ground, rendered via CGI. Several scenes had the monster portrayed by stuntmen in suits. The suits were similar to those used in the Toho films, with the actors' heads being located in the monster's neck region, and the facial movements controlled via animatronics. However, because of the creature's horizontal posture, the stuntmen had to wear metal leg extenders, which allowed them to stand two meters (six feet) off the ground with their feet bent forward. The film's special effects crew also built a ​1⁄6 scale animatronic Godzilla for close-up scenes, whose size outmatched that of Stan Winston's T. rex in Jurassic Park. Kurt Carley performed the suitmation sequences for the adult Godzilla. In Godzilla (2014), the character was portrayed entirely via CGI. Godzilla's design in the reboot was intended to stay true to that of the original series, though the film's special effects team strove to make the monster "more dynamic than a guy in a big rubber suit." To create a CG version of Godzilla, the Moving Picture Company (MPC) studied various animals such as bears, Komodo dragons, lizards, lions and gray wolves which helped the visual effects artists visualize Godzilla's body structure like that of its underlying bone, fat and muscle structure as well as the thickness and texture of its scale. Motion capture was also used for some of Godzilla's movements. T.J. Storm provided the performance capture for Godzilla by wearing sensors in front of a green screen. In Shin Godzilla, a majority of the character was portrayed via CGI, with Mansai Nomura portraying Godzilla through motion capture. Godzilla is one of the most recognizable symbols of Japanese popular culture worldwide and remains an important facet of Japanese films, embodying the kaiju subset of the tokusatsu genre. Godzilla's vaguely humanoid appearance and strained, lumbering movements endeared it to Japanese audiences, who could relate to Godzilla as a sympathetic character, despite its wrathful nature. Audiences respond positively to the character because it acts out of rage and self-preservation and shows where science and technology can go wrong. In 1967, the Keukdong Entertainment Company of South Korea, with production assistance from Toei Company, produced Yongary, Monster from the Deep, a reptilian monster who invades South Korea to consume oil. The film and character has often been branded as a knock-off of Godzilla. Godzilla has been considered a filmographic metaphor for the United States, as well as an allegory of nuclear weapons in general. The earlier Godzilla films, especially the original, portrayed Godzilla as a frightening nuclear-spawned monster. Godzilla represented the fears that many Japanese held about the atomic bombings of Hiroshima and Nagasaki and the possibility of recurrence. As the series progressed, so did Godzilla, changing into a less destructive and more heroic character as the films became geared more towards children. Since then, the character has fallen somewhere in the middle, sometimes portrayed as a protector of the world from external threats and other times as a bringer of destruction. In 1996, Godzilla received the MTV Lifetime Achievement Award, as well as being given a star on the Hollywood Walk of Fame in 2004 to celebrate the premiere of the character's 50th anniversary film, Godzilla: Final Wars. Godzilla's pop-cultural impact has led to the creation of numerous parodies and tributes, as seen in media such as Bambi Meets Godzilla, which was ranked as one of the "50 greatest cartoons", two episodes of Mystery Science Theater 3000 and the song "Godzilla" by Blue Öyster Cult. Godzilla has also been used in advertisements, such as in a commercial for Nike, where Godzilla lost an oversized one-on-one game of basketball to a giant version of NBA player Charles Barkley. The commercial was subsequently adapted into a comic book illustrated by Jeff Butler. Godzilla has also appeared in a commercial for Snickers candy bars, which served as an indirect promo for the 2014 movie. Godzilla's success inspired the creation of numerous other monster characters, such as Gamera, Reptilicus of Denmark, Yonggary of South Korea, Pulgasari of North Korea, Gorgo of the United Kingdom and the Cloverfield monster of the United States. Godzilla's fame and saurian appearance has influenced the scientific community. Gojirasaurus is a dubious genus of coelophysid dinosaur, named by paleontologist and admitted Godzilla fan Kenneth Carpenter. Dakosaurus is an extinct marine crocodile of the Jurassic Period, which researchers informally nicknamed "Godzilla". Paleontologists have written tongue-in-cheek speculative articles about Godzilla's biology, with Ken Carpenter tentatively classifying it as a ceratosaur based on its skull shape, four-fingered hands and dorsal scutes, and paleontologist Darren Naish expressing skepticism while commenting on Godzilla's unusual morphology. Godzilla's ubiquity in pop-culture has led to the mistaken assumption that the character is in the public domain, resulting in litigation by Toho to protect their corporate asset from becoming a generic trademark. In April 2008, Subway depicted a giant monster in a commercial for their Five Dollar Footlong sandwich promotion. Toho filed a lawsuit against Subway for using the character without permission, demanding $150,000 in compensation. In February 2011, Toho sued Honda for depicting a fire-breathing monster in a commercial for the Honda Odyssey. The monster was never mentioned by name, being seen briefly on a video screen inside the minivan. The Sea Shepherd Conservation Society christened a vessel the MV Gojira. Its purpose is to target and harass Japanese whalers in defense of whales in the Southern Ocean Whale Sanctuary. The MV Gojira was renamed the MV Brigitte Bardot in May 2011, due to legal pressure from Toho. Gojira is the name of a French death metal band, formerly known as Godzilla; legal problems forced the band to change their name. In May 2015, Toho launched a lawsuit against Voltage Pictures over a planned picture starring Anne Hathaway. Promotional material released at the Cannes Film Festival used images of Godzilla. Steven Spielberg cited Godzilla as an inspiration for Jurassic Park (1993), specifically Godzilla, King of the Monsters! (1956), which he grew up watching. Spielberg described Godzilla as "the most masterful of all the dinosaur movies because it made you believe it was really happening." Godzilla also influenced the Spielberg film Jaws (1995). The main-belt asteroid 101781 Gojira, discovered by American astronomer Roy Tucker at the Goodricke-Pigott Observatory in 1999, was named in honor of the creature. The official naming citation was published by the Minor Planet Center on 11 July 2018 (M.P.C. 110635). To encourage tourism in April 2015 the central Shinjuku ward of Tokyo named Godzilla an official cultural ambassador. During an unveiling of a giant Godzilla bust at Toho headquarters, Shinjuku mayor Kenichi Yoshizumi stated "Godzilla is a character that is the pride of Japan." The mayor extended a residency certificate to an actor in a rubber suit representing Godzilla, but as the suit's hands were not designed for grasping, it was accepted on Godzilla's behalf by a Toho executive. Reporters noted that Shinjuku ward has been flattened by Godzilla in three Toho movies. ^ a b Ryfle 1998, p. 27. ^ a b Ryfle 1998, p. 142. ^ Ryfle 1998, p. 360. ^ a b Ryfle 1998, p. 361. ^ Perlmutter 2018, p. 248. ^ Morgan, Clay (March 23, 2015). "Ted Cassidy: The Man Behind Lurch, Gorn & TV's Incredible Hulk". Norvillerogers.com. Retrieved July 18, 2018. ^ Ryfle 1998, p. 263. ^ Kalat 2010, p. 232. ^ Kalat 2010, p. 241. ^ a b Ashcraft, Brian (August 1, 2016). "Meet Godzilla Resurgence's Motion Capture Actor". Kotaku. Retrieved August 1, 2016. ^ Miller, Bob (April 1, 2000). "Frank Welker: Master of Many Voices". Animation World Network. Retrieved March 24, 2018. ^ a b Arce, Sergio (May 29, 2014). "Conozca al actor que da vida a Godzilla, quien habló con crhoy.com". crhoy.com. Retrieved March 26, 2015. ^ Pockross, Adam (February 28, 2019). "Genre MVP: The Motion Capture Actor Who's Played Groot, Godzilla, and Iron Man". Syfy Wire. Archived from the original on March 16, 2019. Retrieved March 16, 2019. ^ "Making of the Godzilla Suit". Gojira - Classic Media 2006 Blu-ray/DVD Release. Retrieved April 6, 2018. ^ Solomon 2017, p. 32. ^ DeSentis, John (July 4, 2010). "Godzilla Soundtrack Perfect Collection Box 6". SciFi Japan. Retrieved November 23, 2014. ^ Barr 2016, p. 83. ^ Robbie Collin (May 13, 2014). "Gareth Edwards interview: 'I wanted Godzilla to reflect the questions raised by Fukushima'". The Telegraph. Retrieved May 19, 2016. ^ Ryfle 1998, p. 22. ^ "Gojira Media". Godzila Gojimm. Toho Co., Ltd. Archived from the original on July 11, 2011. Retrieved November 19, 2010. ^ Ryfle 1998, p. 23. ^ a b Ryfle 1998, p. 74. ^ Peter Bradshaw (October 14, 2005). "Godzilla | Culture". London: The Guardian. Retrieved September 25, 2013. ^ Kravets, David (November 24, 2008). "Think Godzilla's Scary? Meet His Lawyers". Wired. Retrieved May 21, 2013. ^ Snider, Mike (August 29, 2006). "Godzilla arouses atomic terror". USA Today. Retrieved May 30, 2013. ^ Tsutsui 2003, p. 23. ^ "Gojira". Turner Classic Movies. Retrieved June 2, 2013. ^ Godzilla 2000 (1999). Directed by Takao Okawara. Toho. ^ Ghidorah, the Three-Headed Monster (1964). Directed by Ishirō Honda. Toho. ^ a b c "Ryuhei Ktamura & Shogo Tomiyama interview - Godzilla Final Wars premiere - PennyBlood.com". Web.archive.org. February 3, 2005. Archived from the original on February 3, 2005. Retrieved September 25, 2013. ^ Tsutsui 2003, p. 12. ^ Ryfle 1998, p. 336. ^ Kalat 2010, p. 225. ^ Seibold, Witney (May 26, 2014). "Godzilla Goodness: Godzilla (1998)". Nerdist. Retrieved March 19, 2018. ^ a b NPR Staff. "What's In A Roar? Crafting Godzilla's Iconic Sound". National Public Radio. Retrieved September 7, 2015. ^ Ray, Amber (May 22, 2014). "'Godzilla': The secrets behind the roar". Entertainment Weekly. Retrieved May 19, 2016. ^ "Godzilla". Gvsdestoroyah.dulcemichaelanya.com. Retrieved September 25, 2013. ^ "Amazing and Interesting Facts about Godzilla Special Effects - Special Effects in Godzilla Movies - Hi-tech - Kids". Web Japan. Retrieved September 25, 2013. ^ a b "Godzilla (1954) stats and bio page". www.tohokingdom.com. Retrieved March 8, 2013. ^ Tsutsui 2003, p. 54-55. ^ a b "Godzilla (1991) stats and bio page". www.tohokingdom.com. Retrieved June 3, 2015. ^ "Godzilla Ultimate Trivia". The Movie Bit. Retrieved May 21, 2014. ^ Owusu, Kwame (February 28, 2014). "The New Godzilla is 350 Feet Tall! Biggest Godzilla Ever!". MovieTribute. Retrieved February 20, 2018. ^ "2016年新作『ゴジラ』　脚本・総監督：庵野秀明氏＆監督：樋口真嗣氏からメッセージ". oricon.co.jp. Retrieved April 1, 2015. ^ Ragone, August (December 9, 2015). "Japanese Press Reveals Shin Godzilla's Size". The Good, the Bad, and Godzilla. Retrieved February 20, 2018. ^ Failes, Ian (October 14, 2016). "The History of Godzilla Is the History of Special Effects". Inverse. Retrieved March 19, 2018. ^ Ryūsuke, Hikawa (June 26, 2014). "Godzilla's Analog Mayhem and the Japanese Special Effects Tradition". Nippon.com. Retrieved March 19, 2018. ^ Kalat 2010, p. 36. ^ Kalat 2010, p. 160. ^ Ryfle 1998, p. 254-257. ^ Kalat 2010, p. 258. ^ Ryfle 1998, p. 298. ^ Ryfle 1998, p. 232. ^ Rickitt, Richard (2006). Designing Movie Creatures and Characters: Behind the Scenes With the Movie Masters. Focal Press. pp. 74–76. ISBN 0-240-80846-0. ^ Ryfle 1998, p. 337-339. ^ Dudek, Duane (November 8, 2013). "Oscar winner & Kenosha native Jim Rygiel gets UWM award". Archived from the original on December 13, 2013. Retrieved December 10, 2013. ^ Carolyn Giardina (December 25, 2014). "Oscars: 'Interstellar,' 'Hobbit' Visual Effects Artists Reveal How They Did It". The Hollywood Reporter. Retrieved December 28, 2014. ^ Sharp, Jasper (2011). Historical Dictionary of Japanese Cinema. Scarecrow Press. p. 67. ISBN 9780810857957. ^ West, Mark (2008). The Japanification of Children's Popular Culture: From Godzilla to Miyazaki. Scarecrow Press. p. vii. ISBN 9780810851214. ^ "The Psychological Appeal of Movie Monsters" (PDF). Calstatela.edu. Archived from the original (PDF) on August 19, 2007. Retrieved September 28, 2013. ^ a b Kalat 2010, p. 92. ^ Demoss, David (June 18, 2010). "Yongary, Monster from the Deep". And You Thought It Was...Safe(?). Retrieved March 19, 2018. ^ Lankes, Kevin (June 22, 2014). "Godzilla's Secret History". Huffington Post. Retrieved March 19, 2018. ^ Goldstein, Rich (May 18, 2014). "A Comprehensive History of Toho's Original Kaiju (and Atomic Allegory) Godzilla". Daily Beast. Retrieved March 19, 2018. ^ "Godzilla Wins The MTV Lifetime Achievement Award In 1996 – Godzilla video". Fanpop. November 3, 1954. Retrieved April 13, 2010. ^ "USATODAY.com - Godzilla gets Hollywood Walk of Fame star". Usatoday30.usatoday.com. November 30, 2004. Retrieved September 25, 2013. ^ Song Review by Donald A. Guarisco. "Godzilla - Blue Öyster Cult | Listen, Appearances, Song Review". AllMusic. Retrieved September 25, 2013. ^ Paul Gravett and Peter Stanbury. Holy Sh*t! The World's Weirdest Comic Books. St. Martin's Press, 2008. 104. ^ Kalat 2010, p. 23. ^ Phipps, Keith (June 2, 2010). "Gamera: The Giant Monster". AV Club. Retrieved March 19, 2018. ^ Don (June 16, 2015). "Reptilicus: Godzilla Goes To Denmark". Schlockmania. Retrieved March 19, 2018. ^ Romano, Nick (April 6, 2015). "How Kim Jong Il Kidnapped a Director, Made a Godzilla Knockoff, and Created a Cult Hit". Vanity Fair. Retrieved March 19, 2018. ^ Murray, Noel (May 8, 2014). "Meet Gorgo, the "British Godzilla"". The Dissolve. Retrieved March 19, 2018. ^ Monetti, Sandro (January 13, 2008). "Cloverfield: Making of a monster". Express. Retrieved March 19, 2018. ^ Naish, Darren (November 1, 2010). "The science of Godzilla, 2010 – Tetrapod Zoology". Scienceblogs.com. Retrieved September 25, 2013. ^ "Sea Shepherd Conservation Society :: The Beast Transforms into a Beauty as Godzilla Becomes the Brigitte Bardot". Seashepherd.org. May 25, 2011. Archived from the original on April 3, 2012. Retrieved September 25, 2013. ^ "Voltage Pictures Sued For Copyright Infringement". torrentfreak.com. Retrieved July 9, 2015. ^ Ryfle, Steve (1998). Japan's Favorite Mon-star: The Unauthorized Biography of "The Big G". ECW Press. p. 15. ISBN 9781550223484. ^ Ryfle, Steve (1998). Japan's Favorite Mon-star: The Unauthorized Biography of "The Big G". ECW Press. p. 17. ISBN 9781550223484. ^ Freer, Ian (2001). The Complete Spielberg. Virgin Books. p. 48. ISBN 9780753505564. ^ Derry, Charles (1977). Dark Dreams: A Psychological History of the Modern Horror Film. A. S. Barnes. p. 82. ISBN 9780498019159. ^ "(101781) Gojira". Minor Planet Center. Retrieved 19 July 2018. ^ "MPC/MPO/MPS Archive". Minor Planet Center. Retrieved 19 July 2018. ^ "Godzilla recruited as tourism ambassador for Tokyo". The Guardian. April 9, 2015. ^ "Godzilla is Tokyo's newest resident and ambassador". New York Post. April 9, 2015. Brothers, Peter H. (2009). Mushroom Clouds and Mushroom Men: The Fantastic Cinema of Ishiro Honda. CreateSpace Books. ISBN 1492790354. Edwards, Gareth (2014). Godzilla. Warner Bros. Pictures. Galbraith IV, Stuart (1998). Monsters Are Attacking Tokyo! The Incredible World of Japanese Fantasy Films. Feral House. ISBN 0922915474. Honda, Ishiro (1970). Monster Zero (English version). Toho Co., Ltd/United Productions of America. Perlmutter, David (2018). The Encyclopedia of American Animated Television Shows. Rowman & Littlefield Publishers. ISBN 1538103737. Ryfle, Steve; Godziszewski, Ed (2017). Ishiro Honda: A Life in Film, from Godzilla to Kurosawa. Wesleyan University Press. ISBN 978-0-8195-7087-1. Tsutsui, William M. (2003). Godzilla On My Mind: Fifty Years of the King of Monsters. Palgrave Macmillan. ISBN 1403964742. Wikimedia Commons has media related to Godzilla.